If you are true mountain bike rider, you would know how the experience is either enhanced or just destroyed because of the tires that are used on the bike. The Best mountain bike tires will make everything worthwhile. Your ride will be free of worries, and you will be able to enjoy your experience without any nagging voices in your head telling you to check the bike over and over again. If you are a newbie in this amazing sporting activity and are overwhelmed by the plethora of information available on the internet, worry not! This article will give you complete and comprehensive information that you will need. Everything you would require to know about mountain bike tires is condensed in this one place. So wipe that sweat off your forehead, sit back, and relax. This article will tell you what to look out for when going to buy a mountain bike tire, and give you information about the best mountain bike tire manufactures out there and what are they making. Read more ahead! Below are five of the most reliable manufacturers you should go for. The mountain bike tire reviews for these products say a lot about them, and will surely satisfy you. This tire has gone through world cups and come out victorious. Designed for professional riders and racers alike, Maxxis Ignitor has well-spaced tread patterns that give the rider low rolling resistance on straight paths. It also has ramped pentagon shaped knobs that give you commendable traction when riding in the corners and on the medium soil. Weighing one pound and measuring 29 inches, this mountain bike tire is made for fast rolling and hooking up in loose conditions. Maxxis Ignitor Mountain Bike Tire features also include eXception Series 62a compound which is long lasting and has the excellent endurance for races. If you are a professional racer or aspire to become one, these mountain bike tires could potentially become your best friends. They have folding beads on them that work for weigh saving and are good for riders who have a keen eye on the weight for better grip. The tire has a 62a type folding ability, which means that it is made up of relatively softer material that could easily be folded into a backpack if you want to carry it around. VelociRaptors have been in business for a long time, but it was in 1994 that they came out with different tires for the front and rear, changing the game forever. WTB VelociRaptor Mountain Tire is the type of tire that comes with specific make for the front and rear wheel set. The front tire promises to give amazing steering control and grip while the rear aspires to provide enhanced traction in any condition you are met with. The WTB VelociRaptormountain bike tire promises to give you one of a kind experience on the track. It is capable of handling any road condition as it has larger threads for better dig up (in the dirt) that enables climbing and corner traction and features exceptional brake system. It is a 26-inch tire that features exceptional mud clearance and grip. These tires promise maximum puncture resistance and great climbing experience. 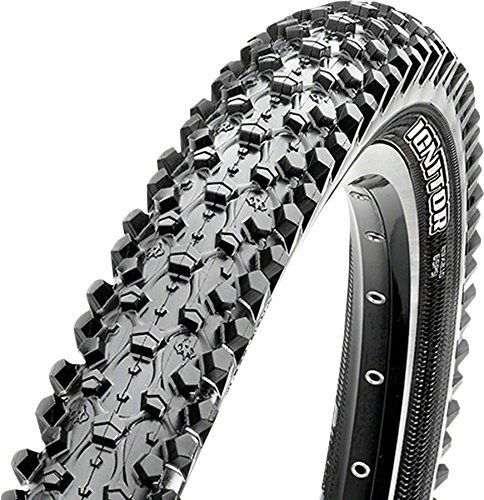 WTB VelociRaptor Mountain Tire available in both folding and wire bead, these tires have had some of the best mountain bike tire reviews on the website as well. They provide great straight line climb even with 1 to 2 inches of mud and perform well in cornering in loose soil as well. Making sharp turns have never been so smooth before! It boasts a large wheel with volume that guarantees fast and smooth rolling. It constitutes a “blocky” tread and center knobs that are ramped that ensures low rolling resistance, increased cornering traction, and wonder grip with control over brakes as well. This tire comes under the category of big tires, and the important part is that it is tubeless. It comes with foldable bead as well. Recently, tubeless tires have been the news. A tubeless tire works by an air tight seal that exists between the tire and a rim, canceling out the need for a tube. A tubeless tire comes with high puncture resistance and is much lighter too. It thus performs better in low-pressure areas as the tire is more stable and well latched on to the ground. For trail biking, a lot of experts recommend tubeless tires. So you can easily ride at low pressure without worrying about punctured tires and shaky grip. Maxxis Ardent Single Compound Tubeless Ready Folding Tire can be used as either the front or rear tire, and boasts a good performance in any trail conditions, soft, hard, loose, wet or dry. Maxxis certainly makes some of the best mountain bike tires. A good tire will have consistent performance on different kinds of terrain, and will be lightweight yet provide stability to the bike. The Continental Trail King Wire Bead Mountain Bike Tires exactly that. 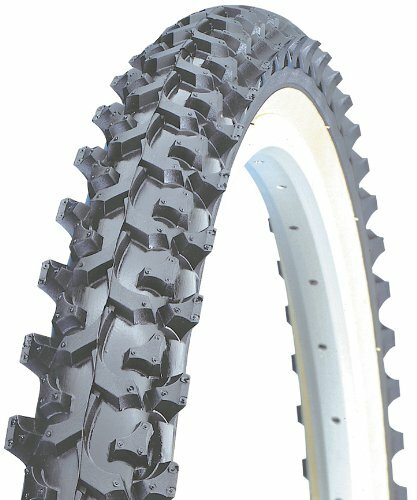 Excellent tire for off road biking trails, it boasts a wire bead making and a weightless footprint. This means that the tire has a smooth and light rolling and commendable performance. It performs well in multiple conditions and provides excellent grip even on wet and rocky terrains. The tires with wire beads is sized at 27.5 by 2.4 inches and are recommended for the excellent traction they offer, even on wet and slippery surfaces. 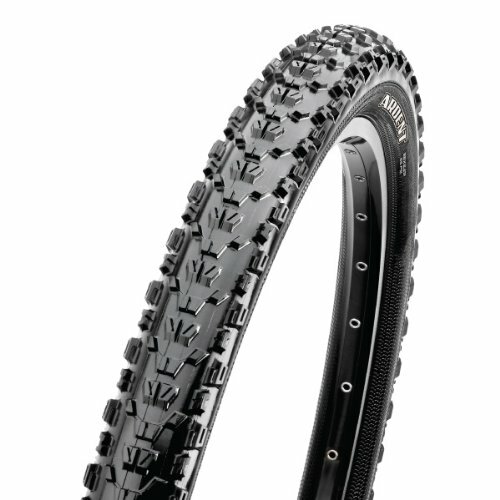 Continental Trail King Wire Bead Mountain Bike Tires are weighs 2.5 pounds and good for use in sports. Continental has said to have revolutionized the game of tires, and ensures stable grip and improved rolling resistance because of the BlackChili Compound element embedded in the tires. 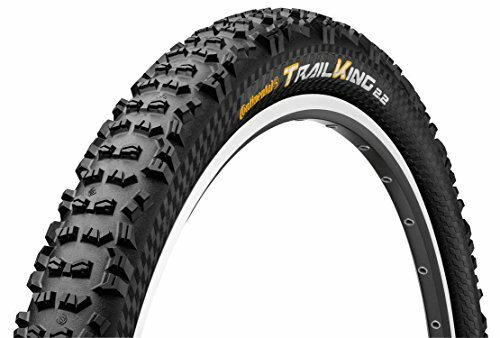 Because of the excellent material used, Continental Trail King tires have been said to perform well on downhill climbing as well, because of the ability to hug the ground. They provide the rider stability and a sense of security in difficult conditions. With a slender black skin and a size of 26 by 1.95 inch, Kenda K850 Aggressive MTB Wire Bead Bicycle Tire will prove to be a better choice than other regular 26 inch tires you may own. It features a smooth center tread, so that there is enough traction to perform well in the dirt. Apart from that, because of this tread, the bike runs well on pavement surface along with other surfaces as well. Weighing 1.4 pounds, the Kenda K850 Aggresive MTB Wire Bread Bicycle Tire promised a trail ride experience you may have never had, due to its tread design. It is durable and will last you for years, despite running on rugged trails, and can be used on both on road and off road trails. It lasts on pavement surface and even crushed granite and on mud. The tires will also protect you from goat head if it penetrates in the lug. For increased endurance, you can use tire liners so no material can latch on the tube and damage the tire. Surely, Kenda K850 is your safest best for a 26 inch tire replacement. These tires come with thick tread sidewalls and work great both uphill and downhill. They are so durable that they will last even if you take them out on a cactus trail! If you have caught the mountain bike bug and want to lose yourself out on the muddy roads, there are a couple of things you would need to know before venturing out. Keep reading on to know vital information about mountain bike tires. A mountain bike tire has specific features like knobs (raised knobs) and lugs that make it easy to dig into muddy terrain, and provide a good grip of the bike. You know you have the best mountain bike tires if your bike gives a low rolling resistance, secured grip, and some sort of “cushioning” so that every journey of yours becomes an experience in itself. There are three essential sizes tires come in: 26 inches, 27.5 inches, and 29 inches, and you get one that fits your wheelset just fine. You will know the size of your wheel set by the manufacturer’s labeling onto it. Apart from wheel size, tire width is also essential, as it affects the performance of the mountain bikes. If the tire is wide, it will provide increased stability on fast speed, and enhanced grip and traction, because of the higher surface area covered. But, they decrease the mud clearance and cause higher friction. To get the most benefit and least problems, a tire with a width of 1.8 to 2.2 inches is deemed to be the best by the bikers. Tires of 2.1 to 2.2 inches of width are considered better for downhill racing. Each brand of mountain bike tires, however, will have their own sizes. Some companies of tires come with specific tires for the front and the rear, which are not necessarily nonexchangeable. You can use the rear tire for the front, but the specific makes of each allow for optimized performance if used in the place it is meant to be at. Front tires consist of additional directional knobs having low profiles that will increase speed and corner traction. A front tire with larger profile can also be found among manufacturers, and this is made to reduce the problem of building up of mud in the wheelset. A rear tire is made such that it has more horizontal spanning knobs to give better traction. This feature also helps prevent the rear wheel from going astray in wet and muddy terrains. A narrower rear tire improves the mud clearance when there is immense debris being carried out by the tire. If you are a cross country rider, you should go for tires with small and smooth knobs that are fast rolling, with a relatively narrow width. This sort of tire will perform well on straight or grassy terrains. If met with conditions, you could change your knobs to larger ones for improved traction. If you are a trail rider, you will need a tire that gives you maximum grip, even more than cross country rider tires. Trail riding mountain bike tires come with soft compounds which tend to latch on to rocky terrains. These tires also have wide profiles so that they can endure corner traction. Basically, the rockier the terrain is, you will need wider tires with softer compounds. The third type of tires are the off-road tires that have a pressure range. This range determines the support for a range of minimum to maximum weight of the rider. As a caution, a rider should not exceed the maximum weight or there will be an imbalance of pressure. When you are venturing out to buy new tires, keep a look out for the specific requirements, you may have according to the trail you are taking. Above are some of the well renowned, best mountain bike tires manufacturers and models that you should check out, according to the user reviews. Keep on reading! 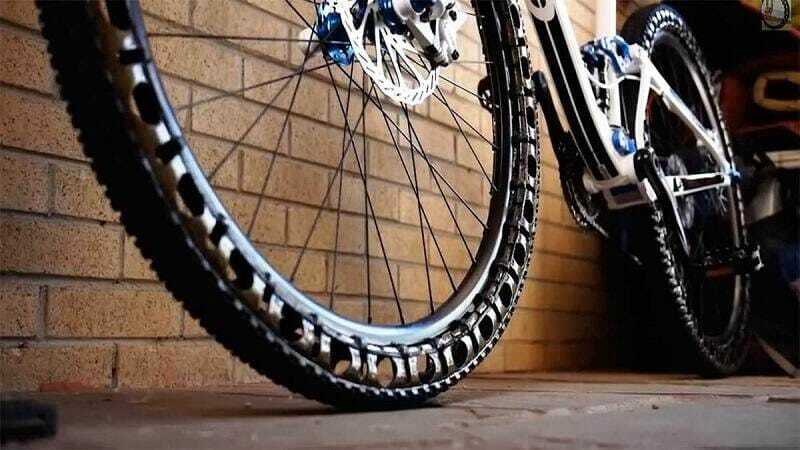 Hopefully by this time you will have acquired a lot of necessary information regarding mountain bike tires through this article. Mountain bike tires, as written above are obviously an essential part of the bike, and the ride, and the journey as well. Before you venture out to buy new ones, remember the essentials. Harder material tires will last longer, but are usually less responsive. Softer material will endure multiple types of trails. Tread patterns determine the ability of the tire to dig in the trail and will also affect the weight when coming downhill. Size is important, but it also depends on the model and size of the wheel set. Width determines the mud clearance and gives control when cornering. Wider widths also give a better handle bar grip and control. In the end it all comes down to tread patterns, what trail you are going to take, and what you want out of the biking experience. Good luck on getting the best mountain bike tires!